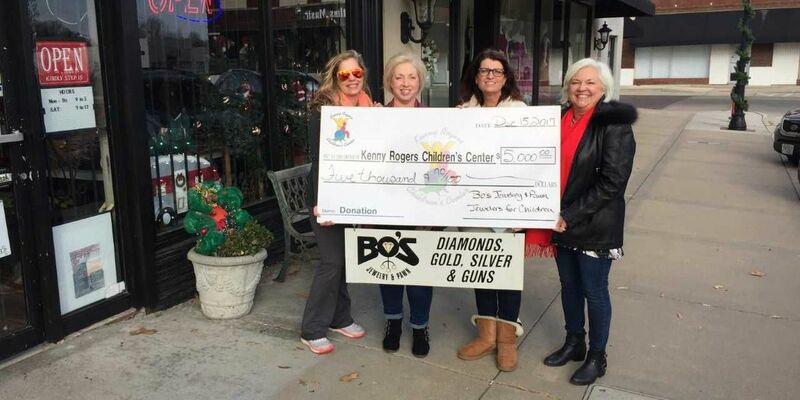 SIKESTON, MO (KFVS) - Bo's Jewelry & Pawn owner, Terry Hurley presented a $5,000 check on Monday from Jewelers for Children (JFC) to the Kenny Rogers Children's Center as part of a Local Grant Program. The store is located in downtown Sikeston, Missouri. JFC is a non-profit organization founded by the jewelry industry in 1999. This is the fifth year the charity has run the program. The goal is to fund ten $5,000 grants for local children's charities around the country. Nominations came from jewelers who sent in their favorite local organization. Public voting on the Jewelers for Children Facebook page determined the charities to receive the grants. "We are so excited to be able to help the Kenny Rogers Children's Center," Hurley said. "It was such an easy way to help support the excellent work the Kenny Rogers Children's Center does locally to help children in our community. Now, through our work with Jewelers for Children, we are able to help them receive one of these generous grants." More than 12,000 visited the Jewelers for Children Facebook page to vote for their favorite charity. Bo's Jewelry & Pawn worked in conjunction with the Kenny Rogers Children's Center to encourage people to vote. "Pulling together, we are helping to provide some much-needed funding for the Kenny Rogers Children's Center," Hurley said. "Just one minute of time resulted in $ 5,000. What could have been easier?"